Agricultural engineering is the engineering discipline that studies agricultural production and processing. Agricultural engineering combines the disciplines of mechanical, civil, electrical and chemical engineering principles with a knowledge of agricultural principles according to technological principles. A key goal of this discipline is to improve the efficacy and sustainability of agricultural practices. One of the leading organizations in this industry is the American Society of Agricultural and Biological Engineers. The ASABE provides safety and regulatory standards for the agricultural industry. These standards and regulations are developed on an international scale and include topics on fertilizers, soil conditions, fisheries, biofuels, biogass, feed machinery, tractors, and machinery. The first curriculum in agricultural engineering was established at Iowa State University by Professor J. B. Davidson in 1903. The American Society of Agricultural Engineers, now known as the American Society of Agricultural and Biological Engineers, was founded in 1907. 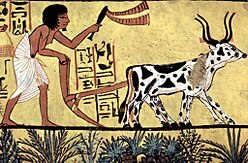 A full history of events directly and indirectly influenced by agricultural engineering, see here. Agricultural engineers may perform tasks such as planning, supervising and managing the building of dairy effluent schemes, irrigation, drainage, flood water control systems, performing environmental impact assessments, agricultural product processing and interpret research results and implement relevant practices. A large percentage of agricultural engineers work in academia or for government agencies such as the United States Department of Agriculture or state agricultural extension services. Some are consultants, employed by private engineering firms, while others work in industry, for manufacturers of agricultural machinery, equipment, processing technology, and structures for housing livestock and storing crops. Agricultural engineers work in production, sales, management, research and development, or applied science. In the United Kingdom the term Agricultural Engineer is often also used to describe a person that repairs or modifies agricultural equipment. Below is a listing of known academic programs that offer bachelor's degrees (B.S. or B.S.E. or B.E / B.Tech) in what ABET terms "Agricultural Engineering", "Biosystems Engineering", "Biological Engineering", or similarly named programs. ABET accredits college and university programs in the disciplines of applied science, computing, engineering, and engineering technology. ^ a b c "ASABE". www.asabe.org. Retrieved 2018-04-13. ^ "ASABE website". Archived from the original on 14 May 2009. Retrieved May 15, 2009. Brown, R.H. (ed). (1988). CRC handbook of engineering in agriculture. Boca Raton, FL. : CRC Press. ISBN 0-8493-3860-3. Field, H. L., Solie, J. B., & Roth, L. O. (2007). Introduction to agricultural engineering technology: a problem solving approach. New York: Springer. ISBN 0-387-36913-9. Stewart, Robert E. (1979). Seven decades that changed America: a history of the American Society of Agricultural Engineers, 1907-1977. St. Joseph, Mich.: ASAE. OCLC 5947727. DeForest, S. S. (2007). The vision that cut drugery from farming forever. St. Joseph, Mich.: ASAE. ISBN 1-892769-61-1.